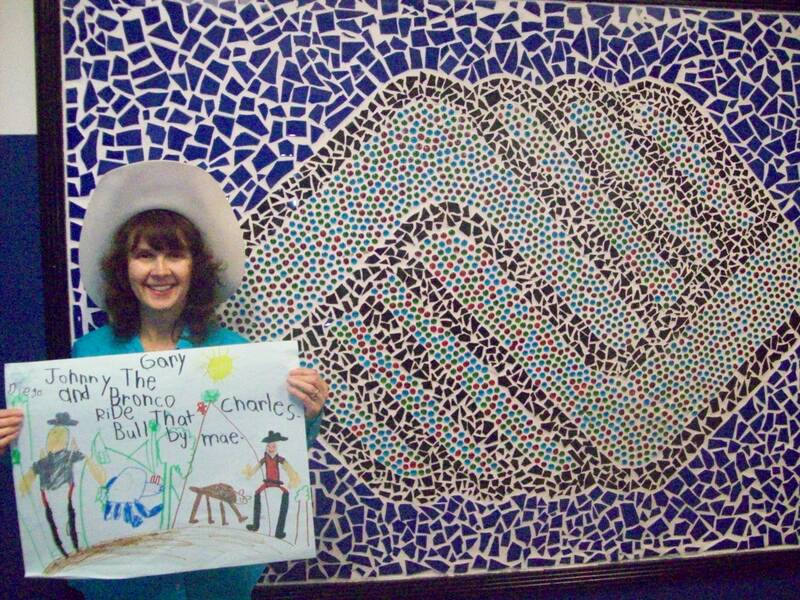 This post comes from AmeriCorps VISTA member Steven Nichols, who is serving at Boys & Girls Clubs of Las Vegas. 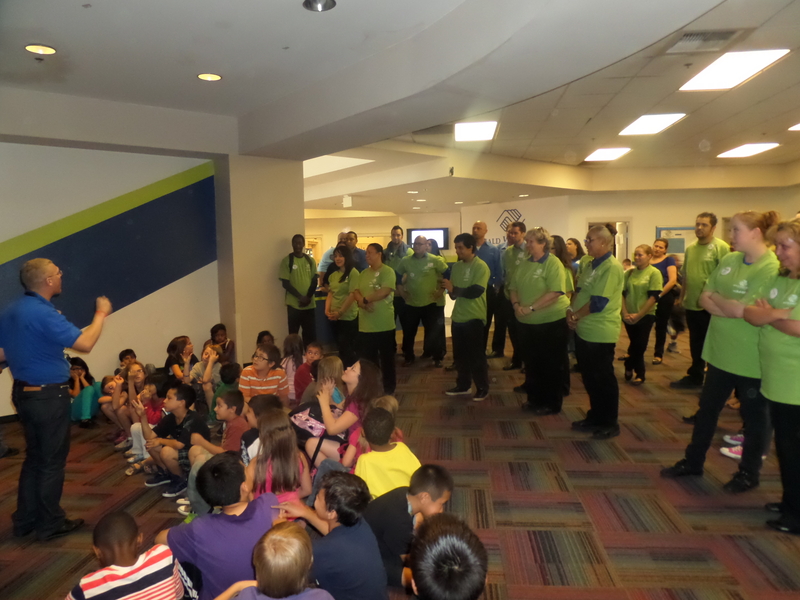 AmeriCorps VISTA member, Steven Nichols, welcomes Ross volunteers and BGCLV club members to Power Hour. Boys & Girls Clubs of Las Vegas has been selected by Ross Stores as a Boys & Girls Clubs of America (BGCA) Ross Store Power Hour grant recipient. This innovative partnership between Ross stores and the Boys & Girls Clubs of America allows students a power hour, a place and time to find tutoring, homework assistance and reinforcement of the subjects they learn in school. Power Hour is a BGCA program that implements better study habits and homework support for members 6- 18 years old in a positive interactive setting. Last night Tuesday, April 3oth BGCLV hosted our first Ross Power Hour engagement activity at our Donald W. Reynolds Clubhouse, the event was a tremendous success and we look forward to continuing this partnership with our local Ross Stores. Boys & Girls Clubs also extends a huge thank you to Mea Charles, author of the Good Gus book series for reading her fantastic stories to the Lied Memorial Club kids. 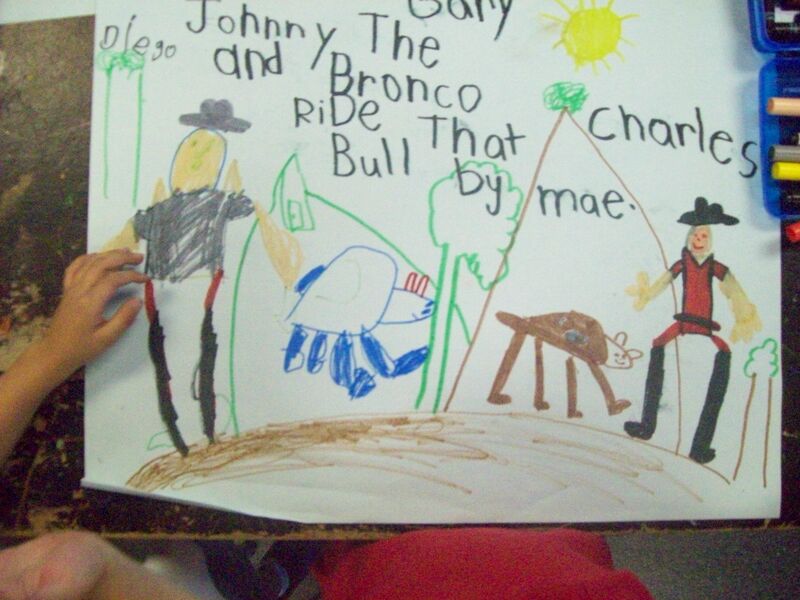 The club members had the privilege of illustrating illustrating the stories they heard! Be a gem for the Diamonds in the Rough Program at the White Horse Youth Ranch! Volunteers are needed to support the growth and confidence of underprivileged youth as they learn the techniques of horsemanship training. You’ll help around the ranch by setting up and participating in pre-riding teambuilding activities, checking in kids and parents, and ensuring the property is clean and tidy. Volunteers are needed to help out in the NextStep thrift store. Volunteers will sort donations, and organize the store. This is a perfect opportunity for a family or a group to give back together. Help give first and second graders from Clark County School District’s at-risk schools the chance to revel in the spirit of the holidays and take part in a disability awareness and anti-bullying program through Cheyenne’s Magical School Bus Tours at Opportunity Village’s Magical Forrest. Volunteers will help with amusement rides, a mini golf course, food and beverage booths, visits with Santa, holiday entertainment, Santa’s gift cabin, and much more! Volunteers will help guide guests to the secret locations of ultra exclusive high-roller suites at six luxury resorts on the Las Vegas Strip. As an added bonus, volunteers will get to tour the suite where they are stationed. It’s fair to assume that we are all like-minded. Everyone either works or volunteers for a cause or an organization making a difference. Our communities’ AmeriCorps members and alums have played integral roles in all of our work. You can say that the AmeriCorps members in the Las Vegas Valley are the work horses or the backbone of our sector. I like to think of them as the trailblazers that bring our organization fresh, temporary hands or ideas. My VISTA position description was vague, like most. On the campus of UNLV for one year, I was tasked with creating partnerships and streamlining communication. I blazed the trail of community meetings, making presentations wherever I was invited, and forged ahead in creating networking groups where ones did not exist. I felt like my VISTA position was for me to craft, for me to meet problems head on and create solutions no one had thought of. Ultimately, I may have taken the term trailblazer too literally after my own assignment as an AmeriCorps VISTA. I actually lead walks on trails often. Shortly after my assignment ended, I was hired to lead a volunteer program with the Outside Las Vegas Foundation (OLVF), a local group that connects southern Nevada residents to our beautiful outdoor resources. The network the AmeriCorps program creates in a community is probably more important than the work done by members individually. I don’t mean network here as the dirty word that everyone uses as a verb to hand out their business card. I mean network in the capacity of connecting ourselves to each other through various affinities and interests. For example, I was hired by the OLVF because of my experience with the VISTA program and, upon attending the first board meeting, I ran into a member, another VISTA alum, and was greeted with open arms. That’s the network I’m talking about. During my first month of my postion following my VISTA term, I contacted Robin and Jacob [at United Way of Southern Nevada’s Volunteer Center] about when, not if, when, I could host a VISTA. Knowing that the possibility of working with someone who had the same affinity for this community and that trailblazing attitude to think outside the box was exactly the type of person that my organization needed. That’s exactly what we got in our first VISTA member: someone willing to ask the tough questions about why we do what we do, if we’ve been using our resources best, or if there was an alternative way to do things. Let’s face it, most of us are stuck inside the box. These are tough questions that staff won’t ask themselves. It’s that new fresh look that we need in our organizations and our communities. Because of this, the OLVF is now blazing trails, figuratively too, into new focus areas and creating new connections that will align ourselves more with the VISTA program and other community initiatives. Knowing that this volunteer would be around to ask these questions and want to leave a mark are a few reasons why being a VISTA supervisor may be more fun than being a VISTA. Having been through the experience, I was ready to handle the questions and the creative ideas that come along with members that start in the position after the enthusiastic pre-service orientation. The flexibility and optimism that the AmeriCorps program brings to our organizations are simply invaluable. We all apply to be a host site and quickly realize that as much as we train a new person in nonprofit skills or capacity building, that same person is teaching us about the way that we do our work and the ever-changing community around us. We are all a part of this network. Our strength lies in numbers, shared experience, and passion. With that, to alum: I want you to remember the pride that you feel as someone who is part of something greater than them. I want you to take that feeling and continue as you step into your next stage of career. Whether you work for a nonprofit, start your own philanthropic or charitable effort, or work for any one of the businesses in this town, the connections that you’ve made to Las Vegas and to others are ones that you should keep. Know that this network can help you. We need more active citizens like you to create a better community as we grow, as we recover, as we continue the work that you’ve done. To supervisors: let’s help them pave the way, give them skills to lead, and allow them room to take over when it’s their time.